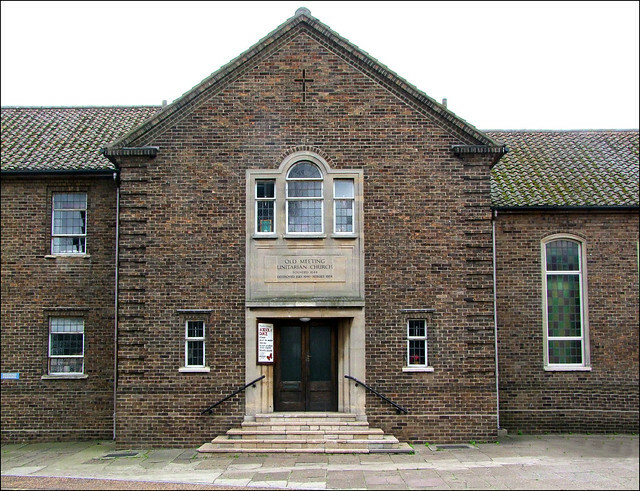 Unitarianism was a popular enthusiasm in urban East Anglia, and particularly so in Norfolk. There was a dissenters chapel on this site from as early as 1644, decades before such things were allowed by the Act of Religious Toleration, but this was in the years that the World Turned Upside Down, and the Puritans were a strong force in Yarmouth. In 1845, a Unitarian chapel was built on the site, taking its name of the Old Meeting Unitarian Church from the previous chapel. However, on the night of 8th July 1941 the chapel was completely destroyed by German bombing, along with much of the Middlegate area.Hauntingly, a building behind the chapel has been preserved as it was left by the bombs that night. The chapel was rebuilt, and reopened in 1954. It is fully of the previous decade, before the 1951 Festival of Britain had jollied up English architecture with its infectious frivolity. The result is a rather austere, even municipal exterior, but the chapel inside is full of light, and its clean lines are rather more uplifting. Gathered together in one corner are the late 18th and early 19th Century memorial plaques rescued from the bombed building, which in turn had taken them from the earlier chapel on the site. One of them is to JM Benyon, this exemplary man, who officiated as minister in this place fifty nine years, inculcating by precept and example the principles of piety and virtue. There are later plaques to ministers on the flanking walls, and a very good stained glass window above the entrance by the King workshop of Norwich. It depicts Christ summoning St Peter and St Andrew to make them fishers of men, a story which must have resonated with generations of Yarmouth men and women. The signatures on the glass can also be found in the windows of St Julian's church in Norwich, similarly rebuilt after German bombing.